One of the really good compact rhododendrons is the species Rhododendron yakushimanum and the many of the hybrids. A low growing plant rarely reaching more than 1m and usually smaller this truly is a dwarf rhododendron. Attractive deep green foliage, white bell shaped flowers in clusters appear from pretty pink buds in spring. If we wish to be correct this should be Rhododendron degronianum subsp. yakushimanum, as like many it has been reclassified recently. So Rhododendron degronianum ssp. yakushimanum ‘Yaku Angel’ (pictured right) is a good example of a modern cultivar. And as a group, the cultivars are often referred to simply as ‘Yaks’. Although R. yakushimanum is a varied species in its natural environment it does have a number of desirable characteristics which have made it a favourite plant with hybridisers both in Japan and in the UK in particular. Firstly its bushy habit, it is naturally low growing and is slow as well. It is an ideal plant for gardeners who are looking for a long term solution, rather than a ‘quick fix’. Because it is a little slow, advanced specimens will not be cheap, however they are certainly worth the money in many cases. The foliage emerges a silvery felty white, most attractive, before darkening. The hairs are for a purpose, they lessen moisture loss and also protect from both cold and heat, as well as insect pests. 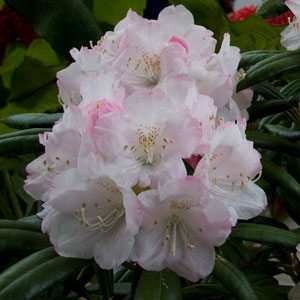 So a Rhododendron that is sun more tolerant and a naturally smaller growing form gives R. yakushimanum and some of its cultivars great garden appeal. Although Rhododendron yakushimanum seem to tolerate a little more sun than other species, a position in semi shade, or at least protection from hot afternoon sun is desirable. A humus rich moist soil is best. Little to no pruning is required. Remove spent flower heads to help keep the bush tidy and compact. Look carefully at the base of the flower head and you will see new buds forming, use secateurs to snip the flower head off above this junction. Rhododendrons are a shallow rooted plant and as such do not like deep or heavy mulch as this tends to suffocate the root system. A light cover of open mulch is preferable. In a good soil most Rhododendrons require little to no fertiliser, they certainly do not require lots of high nitrogen types of fertiliser. When establishing use a liquid seaweed fertiliser for the first two years and then a low nitrogen general purpose fertiliser every 2 years.